In the first part of Understanding the dynamics of towing, we looked primarily at the effect towing a caravan or trailer has on the overall vehicle-trailer combination, now we will have a more detailed look at what affects the tow vehicle. One of the important things to consider in a tow vehicle is wheelbase and tow bar lengths. In general, a longer wheelbase (axle to axle distance) and shorter tow bar length (rear axle to tow ball distance) will make for a more stable tow vehicle. Lets look why that is. NOTE: The tow bar lengths quoted are to demonstrate the principle and are not related to any vehicles. In the above drawing we can see the two vehicles, one with a 500mm axle to tow ball distance, the second with a 750mm axle to tow ball distance. 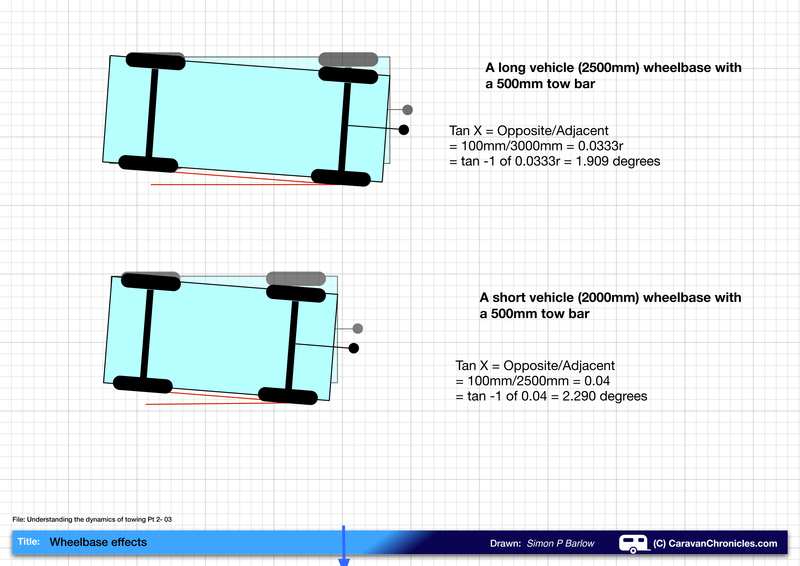 Now using leverage calculations, we can calculate what the same side load or lateral load (red arrow) on the tow ball will have (blue arrow) on the rear wheels with the 750mm tow bar length compared to vehicle with a 500mm tow bar length. Lets assume that the caravan or trailer doesn’t impart a sideways load on the front axle. The front axle then effectively becomes the pivot point. Oh no… here comes the maths! So it can bee seen that the resultant force of a 100Kg acting on a 500mm tow bar is 120Kg’s while the same force acting on a 750mm tow bar is 10Kg more. We learned in Pt 1 that there is an effect called “dutch roll”, most often felt when on motorways where the inside lane has been worn down to two grooves by heavy goods vehicles and the caravan or trailer is ‘hunting’ between these grooves. This will set up a rolling motion in the caravan, and will have the effect of trying to move the hitch from side to side. As the vehicle and caravan travel forward, the undulations will also set up a rocking backwards and forwards motion in the caravan, which has the effect of first lightening the load (nose weight) on the hitch, then increasing it. The combined effect of this is the caravan hitch will move in a circular motion first sideways then down, then sideways in the opposite direction and finally upwards again, repeating continuously. This one source of lateral load on the tow ball. The rear tyres only have so much grip. The grip the tyre have is a function of the friction of the road surface, the friction of the tyre compound, the tyre pressure and the axle load…. (and if you are into Formula 1 it should include the temperature of the road surface and the tyre temperature as well) This grip is not unlimited…. this is easily displayed when trying to pull away rapidly and the tyres spin, likewise when trying to stop quickly the tyres ‘lock up’ and start to slide (untill ABS takes over!) If we were to put a rope through rim of the rear wheel, it might only take a ‘pull’ of 300Kg to drag the rear of vehicle sideways on the road. As you start to apply the force, the tyre wall will deflect and distort the tyre reducing the grip available (more about this later). A static wheel on a vehicle has the most grip, as soon as it starts to rotate, this grip reduces and will continue to reduce the faster the wheel rotates. This is one reason a car can go round a sharp corner at say 30 Mph but at 50 Mph, the dynamic side load has increased, but also the grip (friction) the tyre has on the road surface has also reduced and the rear end will slide outwards resulting in a skid. Does the length of wheelbase matter? Now we have two vehicles, one with the same 2500mm wheelbase and a 500mm tow bar length. The second has a wheelbase of 2000mm and the same 500mm tow bar length. Using the same equation as before…. Looking at the table above, we can see that the same 100Kg sideways force on the tow bar has a greater effect by 5Kg on the short wheel base vehicle when compared to a longer wheelbase vehicle. 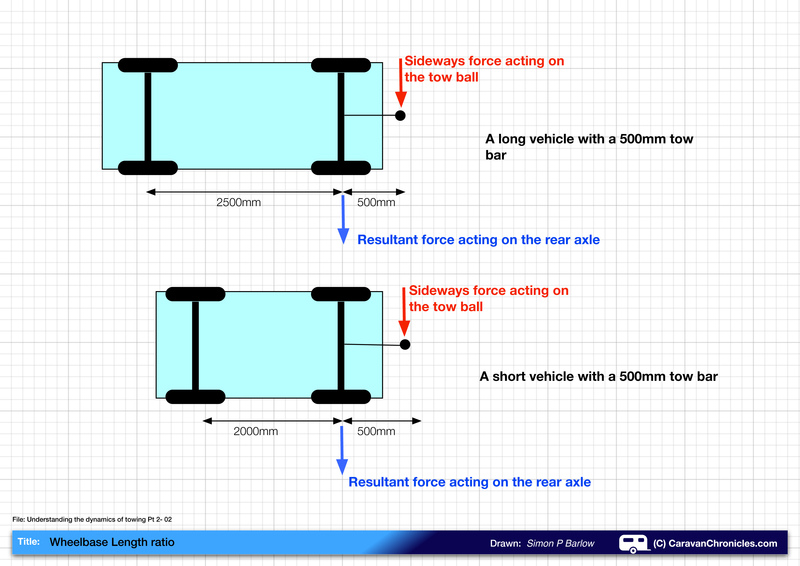 Given the same 100mm of sideways movement of the tow ball by the forces imparted on it, basic trigonometry demonstrates that a short wheelbase (2000mm) vehicle is deflected 2.3 degrees off path, while the same 100mm of sideways movement only deflects the longer wheelbase (2500mm) vehicle by 1.9 degrees. While this does not seem much, remember, you can usually feel though the steering wheel if the tracking is out by more than half a degree, so the lateral push/pull felt in a Short Wheel Base (SWB) vehicle will be more noticeable than a Long Wheel Base (LWB) vehicle. While it will be easier to ‘feel’ the deflection earlier in a short wheel base vehicle, the long wheelbase vehicle will be more stable. Why are articulated lorries so short then? With an articulated tractor unit, the pivot point (tow ball in effect) is actually directly in line with or slightly in front of the rear axle, therefore any lateral load imparted on the pivot point is actually less at the rear axle as some of the force is also transmitted to the front axle. It’s a bit like having your tow ball just behind the front seats. Earlier we were talking about the grip of the tyres on the road surface. There is something else to consider though. We know that sidewall flexing has an effect on grip and as we have just seen, towing a caravan or trailer will put more lateral force on the rear tyre side walls. So what’s the solution? “Put low profile tyres on” OK who said that? That is one solution and on the face of it, low profile tyres would reduce the amount of sidewall flexing therefore be more resistant to the lateral forces imparted on it by the caravan or trailer. But before you rush out to change the tyres, lets have a closer look at this. With a “tall” tyre (some 4 x 4’s have a taller side wall) There is quite a bit of ‘feel’ in the tyres, i.e. you can easily feel when something is pulling you from side to side well before the tyres loose grip. With a low profile tyres, the side walls still deflect but usually with little warning to the driver. The ‘feel’ is almost non existent. The lateral load will increase without much “feel’ and the first you know of it… well it’s usually too late as you have passed the limits of grip and the rear of the vehicle is being pulled side to side in the dreaded “snake”. Low profile tyres are great, if you are a racing driver and have super sharp reflexes and know how much you can push the tyres to the limit holding back just before they break loose. If you don’t believe low profile tyres deform…. just watch the super slow motion clips of Formula 1 cars clipping a kerb. So what is the solution? Well normal profile tyres actually. It’s the best of both scenarios, enough ‘feel’ to give you some clues all is not well and enough rigidity to help resist the lateral loads imparted by the caravan or trailer. However, you do need to check the tyre pressure guide in the owner’s manual for heavy loads and towing. Almost all vehicles, the manufacturer will recommend a higher running pressure in the rear tyres. Please check you own owners handbook for details, as there are exceptions for certain vehicles and wheel/tyre combinations. You are travelling along the road at 50Mph towing your caravan or trailer that weighs 1500Kg. The caravan or trailer starts to sway as a lorry passes you and a tiny amount of the mass of the caravan or trailer….just over 6.5% or 100Kg of the weight now starts acting sideways on the tow bar of the tow vehicle, trying to pull the rear axle sideways. We know there is only so much grip available from the rear tyres and now the force acting on the rear tow ball is taking some of that grip. We feel the caravan or trailer starting to pull us from side to side and the natural reaction is to brake. WRONG! We now know there is only so much grip available at the rear tyres and some of that grip is being used to resist the sway of the caravan or trailer. If we brake, we also use some of this grip…. possibly more than is now available which we don’t want to do. We also know (from Pt 1) that braking reduces the load on the rear axle as the centre of mass of the towing vehicle moves forward therefore reducing grip available still further. If we accelerate we also need some of this grip. Accelerating with 1500Kg’s swinging about behind us will use a lot of the available grip and we might just run out again and we really don’t want to go faster at this point do we? 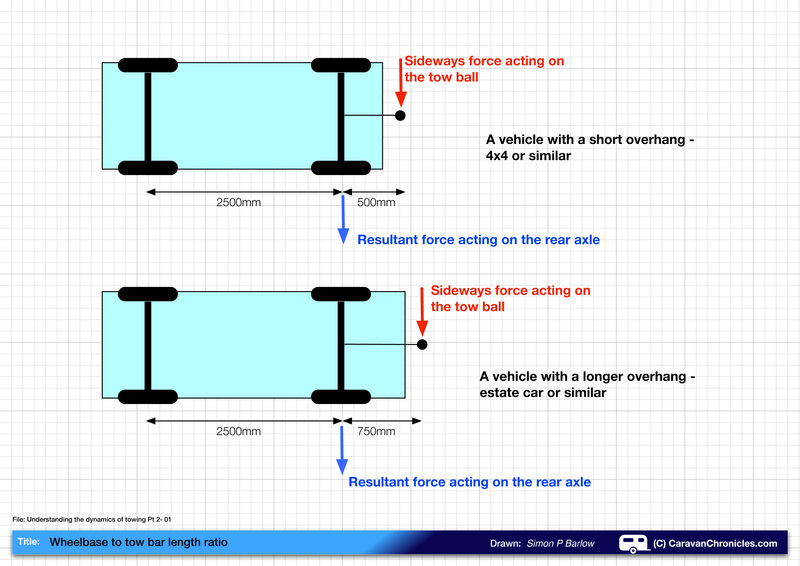 Well we have proved that a longer wheelbase is preferable to a shorter wheelbase given the same towing conditions and trailer, and we have also proved with a bit of school maths that a short tow bar to rear axle length is better than a long tow bar as it imparts less sideways (lateral) force on the rear axle and tyres. We also now know why it is important to keep an eye on the tyre pressures and condition of the tyres on the tow vehicle, as they are now doing so much more work. Is there a downside to having a short tow bar? Yes there is. With a short tow bar, the caravan or trailer will “cut the corner” more than a long tow bar vehicle. So it requires a wider ‘sweep’ when going round corners. On the upside, when reversing the reduced length of the lever effect makes it slightly easier to manoeuvre as the steering effect on the trailer is slowed down, so it becomes less sensitive and gives you more time to react to a deviation off course, although you will have to put slightly more steering input to correct. 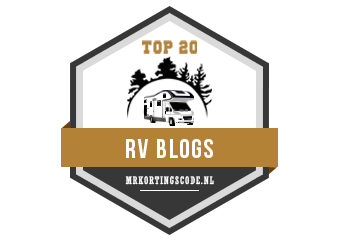 Further Reading: A friend and noted fellow author of caravan books – Collyn Rivers has recently updated his article on “Caravan Dynamics“. While primarily based on caravans for the Australian market it is an excellent article and well worth taking some time out to read it along with a companion article: “Making Caravans Stable“. Happy, safe and knowledgeable towing. Thank you Simon – that has dispelled some of the myths that I thought were true. What a fantastically concise and understandable two articles, so well presented. I lectured for twenty years, and would have been proud to have made such a complex subject so accessible, well done! It also showed me how lucky I must have been, when blissfully ignorant, I hitched up quite large trailers, (car transporters etc) and towed them long distances in the past..phew..quite thought provoking….fortunately, I am a naturally cautious driver. Also for the first time, I can see the sense of requiring a test to tow over a certain weight, of trailer, such as they have now introduced in the UK. Prior to this I couldn’t see just what (apart from reversing) they could test. You should try publishing this, perhaps approaching the trailer/caravan manufacturers/outlets, to use as part of their Indemnity blurb..or at least recommended reading.. Thanks for the comments, that’s great feedback. I always try to make things as easy to understand as possible, even if it’s a complex subject. There is a lot to towing that is not always understood or communicated in an easy manner. Generally I think that the caravanning media is more concerned about reviews and not upsetting advertisers than articles that while educational, may be slightly off-putting to people thinking of buying their first caravan. I’ll continue writing these though as it seems some of the articles are slowly being recognised by the movers and shakers in the industry. ESP and TSA on vehicles is quite complex and each vehicle manufacturer has their own software to manage it. However one key thing to remember, if the vehicle doesn’t know you are towing this will reduce the performance of any ESP – TSA programme built into the vehicle. One of the key things to ensure that the safety and stability systems work on any vehicle is to have the correct vehicle manufactured towing electric’s installed and the (in most cases) required software upgrade to the vehicles computer management system. Maybe in the future I might do an article covering the basic operation of ESP & TSA. Thanks Simon. Mine is Škoda fitted and the software updated afterwards (a trailer shows up on my radio screen when I select reverse and the warning lights go out at a different speed to normal to show TSA is active when a trailer is plugged into the socket). I made very sure of getting all this done specifically to be sure the TSA works. My motto is also better safe than sorry but I just wanted to know if I’ll be ok until the money fairy arrives to pay for the AL-KO hitch! Congratulations for the articles Simon. Interesting and complex subject greatly summarized. Could you recommend me any trailer dynamics/stability book that shows the design criteria, formulas, methodology…? As far as I know there is little work published on trailer stability dynamics. However The Department of Mechanical Engineering at the University of Bath is probably one of the leading institutions in researching the subject. Although as a pilot I did have to have a good understanding of aerodynamics and be able to calculate flow and lift for airfoil sections, to actually delve into the aerodynamics of caravan would really be getting too technical for the blog without lots of explanations to get the basics across – not everyone has an understanding of the Coanda effect for example. I have exchanged emails with Colyn about caravan dynamics and I agree that at a certain speed the parasitic drag from the shape of the rear of the van will at some point be larger than the frontal aerodynamic drag for the caravan moving the air to pass through. Fortunately in the UK we have most of the worlds Formula 1 racing teams based here and the developments and research in CFD by the teams and universities is world class. To that end our caravan manufacturers are highly focused on ‘tuning’ the shape of their products to achieve the greatest aerodynamic efficiency. Most UK and European caravans now have a hollow at the back of the van or a shaped rear roof line to create an artificial low pressure area which enable the air flow around the sides and roof to stay attached as long as possible then un-attach cleanly at the shaped rear reducing the vortices that create drag as much as possible. I am trying to find any conclusion if it is better to have my 2 bikes together at the rear of my caravan or 1 at the rear (the lightest) and 1 at the front end. In other words is the effect on the stability the same with 35 kilo on the rear as it is with 17 front and 17 on the rear. The distance to the axle is nearly the same..
Hi Rob, adding weight to the back and the front, even though it is ‘in balance’ will not help the overall stability of the caravan in my opinion. I would look to trying to carry the bikes on the vehicle or opt for one of the stands that are available for carrying the bikes inside the caravan above the axle. Sadly, much of the content of this and my own writing is being ignored in Australia – a country where many caravan makers and buyers seemingly believe they are immune from the laws of physics and mechanics. We now have may long end-heavy (and high) so-called off-road caravans routinely weighing over 3 tonne and a few four tonne – with tow ball mass (typically 5%-7% and at least two under 4.2% towed by vehicles of two thirds that weight. Many of these vans have a floor level of close to a metre, may be seven/nine metres long with twin heavy spare wheels maybe two metres up plus a tool box – all hung on the extreme rear. These may be driven over loose surfaced dirt roads at 110 km/h plus. One was recently clocked by police at 135 km/h. The roll over rate is demonstrably increasing. The current level is unknown but there were over 130 in 2013. There seems little understanding of oversteer and post after forum post confirms this. See caravanersforum.com (the spelling is their’s). One issue that I do not think is raised in Simon’s superb articles (as less applicable in UK/EU) but an issue here and in the USA is the effects of the bow wave on passing and overtaking heavy trucks on caravans. Australia has far larger such rigs than in UK/EU – up to three six-axle twin-tyre trailers carrying up to 150 tonne at 100 km/h – ofen on dirt roads. See August issue of Rvdaily.com. Another is the effect of the low roll axis enforced by long travel caravan trailing arm suspension – that results in a roll centre around ground level at the caravan axle location – yet pivoted at the front about 400 mm above ground level. This results in a diagonal axis in both planes. It also introduces a major vertical Moment Arm. This is less of an issue in UK/EU as the Al_Ko such has very limited movement. Our may have 300-400 mm wheel travel. The result is that such caravans do not so much roll – but sway. This results in the already high CG being shifted sideways and that plus the low roll centre . . . .